This September 13th, Fantasy Flight Games is kicking off Rebellion Day. 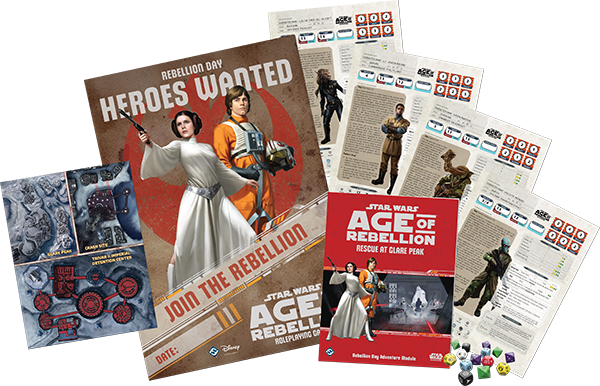 It’s everyone’s chance to try out their Star Wars: Age of Rebellion roleplaying game. Folks who head to participating locations will be able to play the adventure Rescue at Glare Peak! Rescue at Glare Peak is a special introductory Age of Rebellion adventure designed specifically for the event, and it challenges you and your friends to complete a daring rescue mission while the fate of the galaxy hangs in the balance. You can find a location near you that’s participating with this handy list. 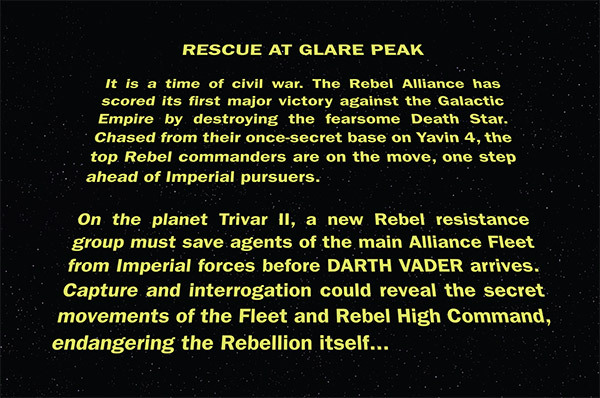 The highlight of Rebellion Day is Rescue at Glare Peak campaign. Designed for two to five players, Rescue at Glare Peak allows individuals to assume the roles of heroic Rebel agents who must work together to rescue a pair of Rebel pilots who have crash-landed on the planet Trivar II. The kit includes four different pre-generated characters which introduce several of the many careers, specializations, skills, and talents of Age of Rebellion. Your group will be able to take on the roles of an Ithorian Engineer, a Bothan Spy, a Human Commander, and a Duros Soldier. You’ll need to make good use of all their tricks, talents, and technology in order to succeed at your mission! The Age of Rebellion is the second of three epic, fully cross-compatible Star Wars roleplaying systems by Fantasy Flight Games. It thrusts players directly into the ongoing Galactic Civil War between the evil Empire and the rag-tag Rebel Alliance. Woefully outnumbered and outgunned by the Empire and its vast military might, player characters may undertake any of a wide variety of missions. They may perform reconnaissance, engage in guerrilla warfare, or recruit citizens from across the galaxy.